The Maverick, which will be known as the Nomad in Kazakhstan, is one of the options. It’s not clear whether there are any takers yet. In December Kazakhstan Paramount Engineering (KPE), a joint venture between South Africa’s Paramount Group and Kazakhstan Engineering, began production at a facility to build armored vehicles in Kazakhstan. According to Kazpravda, KPE’s general director, Erbol Salimov, said that the plant is expected to complete its first armored vehicle in January. IHS Jane’s reports that the plant is aiming to assemble 200 armored vehicles a year, while earlier this year the Astana Times pegged that number at 360. Construction on the 15,000 square meter facility located outside Astana began in 2014 and was completed in October. Kazinform says it cost upwards of 7.80 billion tenge ($25 million). The plant will assemble an indigenous version of Paramount’s Marauder, called Arlan, an armored vehicle capable of carrying 10 people. Few other details are available, through KPE’s website boasts that the Arlan “is one of the best armored wheeled vehicles in the world in its class for a number of indicators.” The Arlan was developed in collaboration with the Kazakh military to suit the steppe winter. Kazakhstan is KPE’s first customer. Other vehicles KPE says it will produce are the Barys, an armored 6×6 infantry fighting vehicle, and the Nomad, an armored police vehicle. Both are localized versions of Paramount’s Mbombe and Maverick. The news, however, is muddled by unclear reporting on which countries will purchase vehicles from Kazakhstan. Kazinform reported that Jordan will be KPE’s second customer, after signing a memorandum for 50 vehicles. Salimov told journalists that the vehicles produced at the plant are “meant for export, as per a license agreement, to 12 countries — CIS, Middle East, China, and Russia.” It’s unclear, however, if any of those countries have expressed interested in purchasing armored vehicles from Kazakhstan. Even the Jordan deal is doubtful. In May 2014 it was reported that Arabian Defense Industries (ADI) would produce Mbombes for Jordan. ADI is a joint venture between the King Abdullah II Design and Development Bureau (KADDB) and Paramount Group. Earlier this year Paramount announced that a contract for 50 Mbombes was signed with Jordan. CEO of KADDB, Major General Omar Al Kaldi said, “The production of Mbombe in Jordan signals an important milestone in the continuing growth of the defense industrial capability in the Middle East.” The press release specifically states that the vehicles for Jordan will be manufactured in Jordan and South Africa. So Kazakhstan is enticing foreign companies to set up joint ventures with local firms, building factories in Kazakhstan and getting the foreign engineers to train local staff and to offer up their blueprints so that Kazakhs will eventually be able to build the armaments themselves. It’s not a setup the foreign companies relish – they make more money by simply selling equipment directly. But Kazakhstan’s growing wealth has led to ambitious military modernization plans, and foreign firms see a potentially lucrative market. 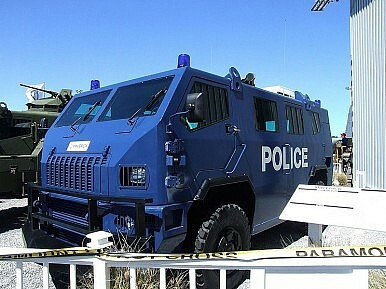 The Paramount Group is not the only company looking to assemble armored vehicles in Kazakhstan. Over the summer, IHS Jane’s reported that Kaz Kioti, a manufacturer of agricultural equipment, was in negotiations with Kazakhstan Engineering to produce vehicles made by Turkey’s BMC. The Kazakh company was interested in assembling several BMC vehicles, including tactical transports, MRAPs, and a multipurpose armored vehicle. Turkey’s Aselsan, in a joint venture with Kazakhstan Engineering, opened a facility in 2013 in Kazakhstan to produce a variety of electro-optical products, such as thermal cameras and field glasses. Who Will Run Post-Nazarbayev Kazakhstan?Settling the Caspian Issue and Realizing the Trans-Caspian Energy CorridorCarefully, Kazakhstan Confronts China About Kazakhs in Xinjiang Re-Education CampsThe Israel-Kazakhstan PartnershipHow Can Kazakhstan Revitalize Its Civil Society?